The best way to describe my journey this past weekend. Although it had some setbacks, it was so much fun! Earlier in the week, my friend and I decided that it would be a fun, absolutely nostalgic moment if we caught the train down to Universal City Walk. Ten years ago, that was the place to be for all teenagers until 9:00pm on weekdays when our curfew was enforced and we were subsequently kicked out of the park. Man, great memories! Well, I guess we wanted to relive our younger years before we transitioned into our new chapters of life: her transferring to a university and me entering the MD program at Drew/UCLA. Our excitement left quickly once we arrived and circled the entire city walk in under an hour. I have no clue how City Walk kept me entertained all those years ago, maybe it was the teenage shenanigans or the enjoyment I felt because I had a bit of freedom. I have no clue and there’s no use in overanalyzing it lol. 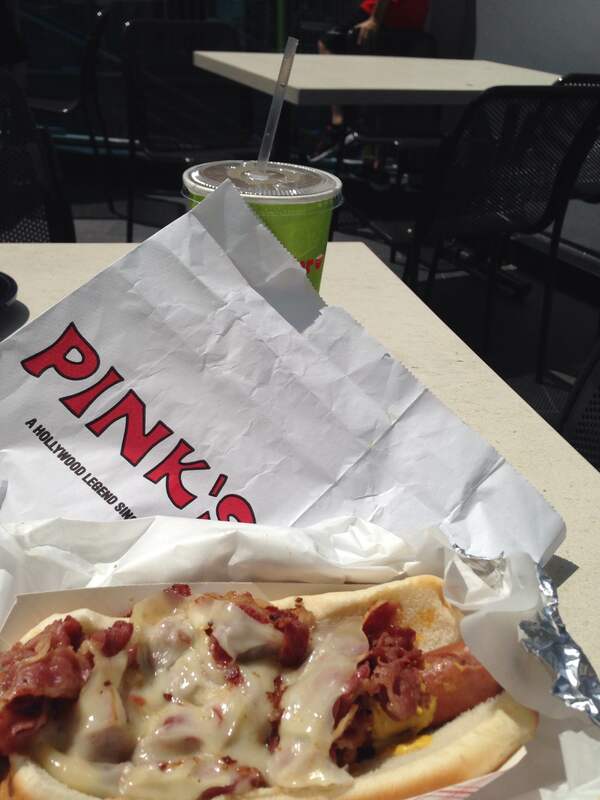 City Walk this past weekend did bring forth a first: my first hot dog from Pink’s. It was well worth the wait, and it lived up to its hype. I wanted to splurge, so I had a pastrami dog. Ugh, it was heaven! It almost overpowered my conversations with my friend as I took to Instagram and Snapchat to gush about this momentous occasion. Wonderful. If I could sum up my feelings about Pink’s Hot Dogs into one word, it would be wonderful. Pastrami Hot Dog. Ahh for the gods! Despite the deliciousness of Pink’s, we knew that an hour and half ride across town had to amass to more than this. My friend and I quickly devoured our meals and decided on a Plan B: Hollywood and Highland. We knew that Hollywood and Highland was tourist central, had numerous sidewalk attractions and was where we needed to be! Psh, it was only one train stop away from our original destination, why not? When I say we had a fabulous time, I mean it! We ran into familiar faces and got a free makeover by MAC artists (They were promoting their wash and dry mac collection). I even fell victim to the selfie-stick trend and found one for five bucks! Personally, that was a steal that I could not pass up. Nonetheless, this rerouted mini-adventure was absolutely one for the books! It will definitely be a cherished memory as I enter this new stage of my life. Lesson learned: Be okay with change because there may be something better in store for you. P.S. I am becoming more of a Positive Patricia, thank you for your advice in terms of music etc. It definitely helps a lot! Sounds like an awesome adventure! I had my first Pink’s recently too. Waited in line for half an hour at midnight. I still don’t know how the selfie-stick works, but I’ll get the hang of it lol!